Reading and share top 337 famous quotes and sayings about Prosperity by famous authors and people. 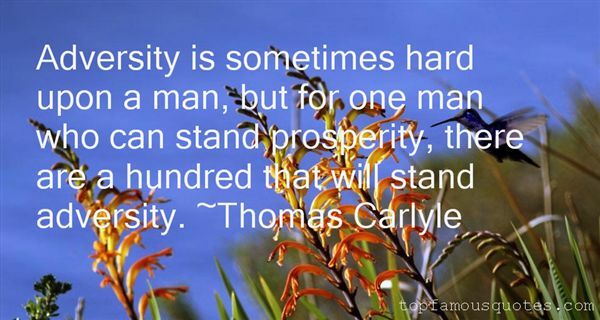 Browse top 337 famous quotes and sayings about Prosperity by most favorite authors. 1. "I dream of a true husband—a good man, not a brute, nor a champion of men on the battlefield; I dream but of a gentle man, one who neither speaks too loud nor ignores evil. I pray for such a like-minded mate, who will be ever for me like harmony to music, virtue to the soul, prosperity to the state, and forethought to the universe." 3. "Four years of Jimmy Carter gave us two titanic Reagan landslides, peace and prosperity for eight blessed years - and even a third term for his feckless vice president, George H.W. Bush." 4. "I am created for success and the good life. I have in me the indestructible life. I walk in health, victory, prosperity and strength always because the Greater One lives in me!" 5. "Why will a man waste his creative potency and superlative powers in vanity when he can live in prosperity?" 6. "Stop reacting to poverty,act upon yourself and start living in prosperity." 7. "Never think you can convince God through prayer for a blessing. Praying for prosperity is a wrong weapon for war. If prayer could bring money, all intercessors would be billionaires." 8. "If you keep silent, keep silent by love: if you speak, speak by love; if you correct, correct by love; if you pardon, pardon by love; let love be rooted in you, and from the root nothing but good can grow.Love and do what you will.Love endures in adversity, is moderate in prosperity; brave under harsh sufferings, cheerful in good works; utterly reliable in temptation, utterly open-handed in hospitality; as happy as can be among true brothers and sisters, as patient as you can get among the false one's. The soul of the scriptures, the force of prophecy, the saving power of the sacraments, the fruit of faith, the wealth of the poor, the life of the dying.Love is all." 9. "In the world union, prosperity is a science, self-interest a new religion, peace is at hand and the future has never looked brighter." 10. "The success of our economy has always depended not just on the size of our gross domestic product, but on the reach of our prosperity; on the ability to extend opportunity to every willing heart - not out of charity, but because it is the surest route to our common good." 11. "This is our time, to put our people back to work and open doors of opportunity for our kids; to restore prosperity and promote the cause of peace; to reclaim the American dream and reaffirm that fundamental truth, that, out of many, we are one; that while we breathe, we hope. And where we are met with cynicism and doubts and those who tell us that we can't, we will respond with that timeless creed that sums up the spirit of a people: Yes, we can." 12. "All who are not lunatics are agreed about certain things. That it is better to be alive than dead, better to be adequately fed than starved, better to be free than a slave. Many people desire those things only for themselves and their friends; they are quite content that their enemies should suffer. These people can be refuted by science: mankind has become so much one family that we cannot insure our own prosperity except by insuring that of everyone else. If you wish to be happy yourself, you must resign yourself to seeing others also happy." 13. "Countries around the world are celebrating new oil and natural gas discoveries that hold the promise of greater prosperity for their citizens." 14. "Prosperity is only an instrument to be used, not a deity to be worshipped." 15. "U.S. economic prosperity is closely tied to the availability of a reliable and affordable supply of energy." 16. "To be great in our times too often means to have great prosperity and no moral magnanimity at all." 17. "No greater place to be than in a leadership position to lead young minds to prosperity"
18. "All through the years since World War II, the Japanese people have, I am convinced, made strenuous efforts to preserve and promote world peace, contributing to the progress and prosperity of mankind." 19. "It's amazing I won. I was running against peace, prosperity, and incumbency." 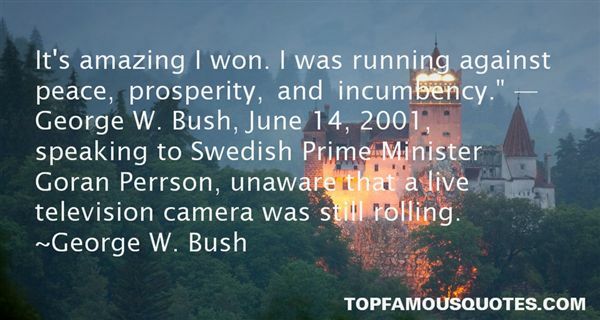 —George W. Bush, June 14, 2001, speaking to Swedish Prime Minister Goran Perrson, unaware that a live television camera was still rolling." 20. "Global warming has melted the polar ice caps, raised the levels of the oceans and flooded the earth's great cities. Despite its evident prosperity, New Jersey is scarcely Utopia." 21. "But what I really believe is education is a key to pretty much everything - prosperity, economics, peace, stability." 22. "Sadly, prosperity is not the only reason people forget God. It can also be hard to remember Him when our lives go badly. When we struggle, as so many do, in grinding poverty or when our enemies prevail against us or when sickness is not healed, the enemy of our souls can send his evil message that there is no God or that if He exists He does not care about us. Then it can be hard for the Holy Ghost to bring to our remembrance the lifetime of blessings the Lord has given us from our infancy and in the midst of our distress.There is a simple cure for the terrible malady of forgetting God, His blessings, and His messages to us. Jesus Christ promised it to His disciples when He was about to be crucified, resurrected, and then taken away from them to ascend in glory to His Father. They were concerned to know how they would be able to endure when He was no longer with them.Here is the promise. It was fulfilled for them then. It can be fulfilled for all of us now." 23. "Passion + Purpose = Prosperity." 24. "I can promise you that women working together - linked, informed and educated - can bring peace and prosperity to this forsaken planet." 25. "A sustainable world means working together to create prosperity for all." 26. "To seek "causes" of poverty in this way is to enter an intellectual dead end because poverty has no causes. Only prosperity has causes." 27. "Do I mind losing? No, because losses and wins are just the bricks on the path to success. Both losing and winning are needed to find prosperity." 28. "I have had the view that cutting wages is not the path to prosperity, and one of the great myths propagated about my attitude to industrial relations is that I believe in lower wages. I've never believed in lower wages. Never. Never believed in lower wages, I've never believed in lower wages as an economic instrument." 29. "Now, in Texas, we believe in the rugged individual. Texas may be the one place where people actually still have bootstraps, and we expect folks to pull themselves up by them. But we also recognize there are some things we can't do alone. We have to come together and invest in opportunity today for prosperity tomorrow." 30. "Doubt is a form of pessimism that acts as an agent, which is sent to hinder prosperity on its materilization journey." 31. "The failure of national economic policy is costing us more than jobs; it has begun to weaken that uniquely American spirit of risk-taking, large ambition, and optimism about the future. We must rally them now to bold departures that rebuild our national morale as well as our material prosperity." 32. "Artha - attainment of wealth, material prosperity,Its realization on righteous and moral basis be;- 5 -"
33. "Be so strong that nothing can disturb your peace of mind. Talk health, happiness, and prosperity to every person you meet. Make all your friends feel there is something special in them. Look at the sunny side of everything. Think only the best, be as enthusiastic about the success of others as you are about your own.Forget the mistakes of the past and press on to the greater achievements of the future. Give everyone a smile. Spend so much time improving yourself that you have no time left to criticize others. Be too big for worry and too noble for anger." 34. "Revolution was the great nightmare of eighteenth-century British society, and when first the American Revolution of 1776, then the French Revolution of 1789 overturned the accepted order, the United Kingdom exercised all its power so that revolution would not damage its own hardwon security and growing prosperity. Eighteenth-century writing is full of pride in England as the land of liberty (far ahead of France, the great rival, in political maturity), and saw a corresponding growth in national self-confidence accompanying the expansion of empire." 35. "No nation ever taxed itself into prosperity." 36. "A whole generation of Americans will retire in poverty instead of prosperity, because they simply are not preparing for retirement now." 37. "Well, the important message that we've always carried to China is that we look forward to your progress and prosperity, we look forward to you playing a role in the progress and prosperity of this region and we look forward to stability in your relations with others." 38. "No man is crushed by misfortune unless he has first been deceived by prosperity"
39. "While no amount of financial wealth can guarantee an experience of prosperity, it is possible to experience prosperity at almost any level of income, except when we are unable to meet our basic physical needs." 40. "Adversity is sometimes hard upon a man, but for one man who can stand prosperity, there are a hundred that will stand adversity." 41. "As hard as life may become for all of us,Truth is...the only way to prosperity is forward. Keep moving forward in your thoughts, in your paths and your life." 42. "Humanity will be better served when those in power, privileged and keepers of it's flame realize that poverty is not a crime nor a curse but a condition though at times crippling can be the catalyst that can lead many from despair to prosperity. Each time we help feed the hungry we not only help satisfy their needs but also ours. When we help shelter the homeless, we also strengthen the foundations of our souls in the process. When we show others love and compassion...it will always come back to us. In all we do to help better humanity...it is never done in vain." 43. "Truth is...You wouldn't want to sail your boat backwards, so why would you want to sail backwards with your life? Prosperity is always ahead of you & never behind!Bullying Ben"
44. "To rejoice in another's prosperity is to give content to your lot; to mitigate another's grief is to alleviate or dispel your own." 45. "...the priests of all these cults, the singers, shouters, prayers and exhorters of Bootstrap-lifting have as their distinguishing characteristic that they do very little lifting at their own bootstraps, and less at any other man's. Now and then you may see one bend and give a delicate tug, of a purely symbolical character: as when the Supreme Pontiff of the Roman Bootstrap-lifters comes once a year to wash the feet of the poor; or when the Sunday-school Superintendent of the Baptist Bootstrap-lifters shakes the hand of one of his Colorado mine-slaves. But for the most part the priests and preachers of Bootstrap-lifting walk haughtily erect, many of them being so swollen with prosperity that they could not reach their bootstraps if they wanted to. Their role in life is to exhort other men to more vigorous efforts at self-elevation, that the agents of the Wholesale Pickpockets' Association may ply their immemorial role with less chance of interference." 46. "To be wicked does not insure prosperity." 47. "Therefore, for me, living true to my self may be defined as: Making the daily choices in all areas of my life that are in the best interests of my survival, evolution and prosperity, that aid the ongoing achievement of the highest physical, mental and spiritual objectives of which I am capable, that are based on the most correct assessment of reality I have available, and that honor the evolving truth of who I am and who I choose to be, all in the personal pursuit of freedom, function, fun, as well as the highest good of all." 48. "...magazines devoted to the religion of success appear as Makers of America. They mean just about that when they preach evolution, progress, prosperity, being constructive, the American way of doing things. It is easy to laugh, but, in fact, they are using a very great pattern of human endeavor. For one thing it adopts an impersonal criterion; for another it adopts an earthly criterion; for a third it is habituating men to think quantitatively. To be sure the idea confuses excellence with size, happiness with speed, and human nature with contraption. Yet the same motives are at work which have ever actuated any moral code, or ever will. The desire fir the biggest, the fastest, the highest, or if you are a maker of wristwatches or microscopes the smallest; the love in short of the superlative and the "peerless," is in essence and possibility a noble passion." 49. 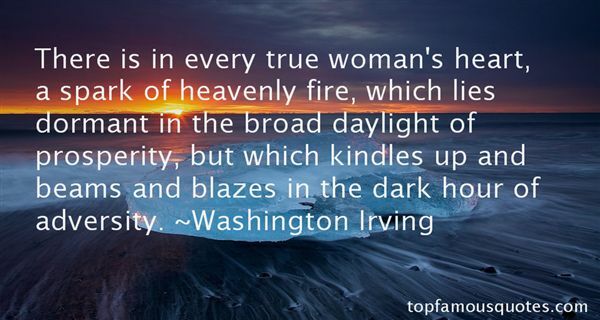 "There is in every true woman's heart, a spark of heavenly fire, which lies dormant in the broad daylight of prosperity, but which kindles up and beams and blazes in the dark hour of adversity." 50. "Is there any wilderness of sand in the deserts of Arabia, is there any prospect of desolation among the ruins of Palestine, which can rival the repelling effect on the eye, and the depressing influence on the mind, of an English country town in the first stage of its existence, and in the transition state of its prosperity?" I wish to go with you, not as man and wife, but merely as friends, travel companions, the sort of happy-go-lucky chums about whom rollicking old ballads of the road are written."